1893: A Lincoln newspaper blames biased officiating as Nebraska must settle for a 10-10 tie with Baker. 1898: Nebraska's game with Grinnell is canceled in a dispute over the choice of officials. 1903: The Cornhuskers give up their first points of the season in their sixth game, a 17-6 win at Iowa. 1908: Nebraska holds off Iowa, 11-8, in Iowa City as the Hawkeyes fail on a field goal attempt in the last four minutes of play. Mike Hyland's drop-kick would have been worth four points. 1913: The Cornhuskers fall into a 9-0 hole in the first quarter at Iowa State but then roll to an 18-9 victory. 1918: Still having played just one official game because of World War I and an influenza epidemic, Nebraska routs Cotner College in a practice game, 39-0. Spectators were barred from attending. 1923: Verne Lewellen's 60-yard interception return gives Nebraska a 7-7 tie with Missouri in Columbia. All the scoring came in the first quarter, and the Tigers' TD came on a short drive following a blocked punt. The Cornhuskers had a roughly 2-1 advantage in yardage, the Lincoln Star's Cy Sherman reported. «1928: Nebraska crushes Missouri, 24-0, in Lincoln. Ed Blue Howell rushed for two TDs, including a 22-yarder in the fourth quarter. Missouri drove to NU's 1-yard line in the opening minutes but came up empty on a fourth-down pass. 1933: The Huskers give up their first points of the season but turn back visiting Oklahoma, 16-7, in a game that saw the teams combine for 13 fumbles (four lost) and just 211 yards of offense. NU's Hubert Boswell scored on the opening kickoff when the Sooners failed to cover the ball in their own end zone. That set the tone for what the Lincoln Journal and Star called "a ragged battle that featured fumbles, stumbles and mental lapses the like of which few of the 18,000 spectators ever saw before." 1938: Missouri's Paul Christman passes for one TD and runs for another as the Tigers spoil Nebraska's Homecoming, 13-10. Herm Rohrig returned the opening kickoff of the second half 96 yards for the Huskers' only touchdown. Nebraska was outyarded by 292-181. 1943: Missouri hands Nebraska its worst defeat to date in the Huskers-Tigers rivalry, 54-20. One of the few Husker highlights was a 28-yard run by Ted Kenfield for NU's first touchdown. 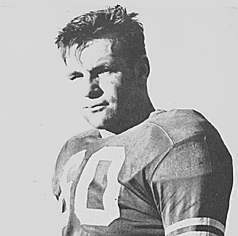 1953: Halfback Bob Smith's 56-yard run immediately after a failed fake punt by Kansas turns the tide in a 9-0 win over the Jayhawks in Lincoln. Kansas outgained the Huskers, 301-284, but KU was hurt by six lost fumbles. Smith finished with 141 yards rushing. The game was played shortly after a vote of confidence in embattled Nebraska coach Bill Glassford by the NU Board of Regents. 1958: The Huskers fail to penetrate the Missouri 25-yard line in a 31-0 Homecoming loss in Lincoln. Nebraska was outyarded 375-185, and students hanged an effigy of coach Bill Jennings afterward. «1963: Missouri eschews a tie and goes for two points after a touchdown midway through the fourth quarter, but Nebraska's Bruce Smith (pictured) breaks up Gary Lane's pass to preserve a 13-12 Husker win in Columbia. 1968: Nebraska drives 71 yards for a TD just before halftime for a 21-7 lead en route to a 24-13 win at Iowa State. 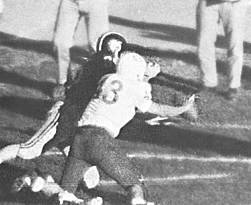 1973: Nebraska goes for a touchdown instead of a field goal from inside the 1-yard line with 2:23 left, but Oklahoma State's defense stops Tony Davis and the teams finish in a 17-17 tie in Stillwater. 1978: The Huskers turn away a late Oklahoma State threat and hang on for a 22-14 win in Lincoln. 1983: The Huskers beat Kansas State, 51-25, in Manhattan, but doubts about the Blackshirts mount. Mean­while, a Denver promoter's hopes for a Texas-Nebraska championship game outside the bowl system are dashed while the likelihood of a bowl match with Miami on the Hurricanes' home field begins to solidify. 1988: Stymied during the first half, NU's offense comes up with big plays in the final 30 minutes for a 26-18 win over Missouri in Lincoln. 1993: Big plays by Corey Dixon help the Huskers jump to a 21-3 first-quarter lead at Colorado, and Nebraska hangs on for a 21-17 victory. «1998: Ne­bras­ka's le­gen­dary Tom Train Wreck Novak, the Hus­kers' only four-time all-con­fer­ence se­­lec­tion, dies in Lincoln at age 72. Also, Ricky Williams and Texas upset Nebraska, 20-16, snapping the Huskers' 47-game home winning streak. 2003: NU musters just 175 yards of offense in a 31-7 loss at Texas. 2008: Oklahoma jumps to a 35-0 first-quarter lead in a 62-28 rout in Norman. The game was preceded by a reunion of the two schools' Game of the Century teams of 1971. 2013: Quarterback Ron Kellogg III's 49-yard pass to freshman receiver Jordan Westerkamp on the final play gives Nebraska a 27-24 win over Northwestern.